That bowl contains a hefty 715g of lovely ripe 100% organic pesticide free blackberries which would have set us back about £7.50 had we bought them from Tescos. We could have picked more, but we decided to be very selective: nothing below mid-thigh (dog height ;-) ) and nothing that didn't come off easily. This ensured we only picked nice ripe berries (it is still early in the picking season) and left the unripe on the branches for further ripening and picking by other foragers. We were also in summer wear so nettles and prickles were a bit of a deterrent. 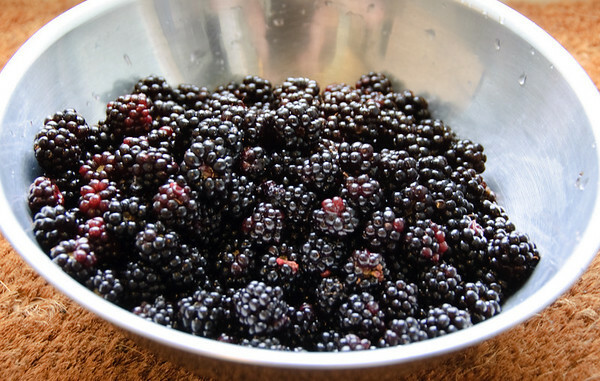 We've not decided what we'll make with our blackberries just yet (jam or crumble are on the list so far) so we've washed them and frozen them for the moment. We're going to give it a couple more weeks and head back to gather some more along with some rose hips and damson berries which definitely are not ready for picking yet.